If you’ve somehow found my obscure site then you probably already know a little bit about honeypots and their functionality, if not here is a good breakdown. There are many different types of honeypots and these different types are explained very well in the book Virtual Honeypots which I highly recommend you read if you are serious about deploying a honeypot. This series of articles will focus on honeypots using an application called honeyd. There are a number of honeypot solutions out there but I personally feel like honeyd is a great fit because it can be relatively simple or you can start tweaking it to get a more full featured product. You may think of honeypots as internet facing and it’s true that they can be configured that way but during this series of tutorials I will only be using honeyd on an internal network. Internet facing honeypots are mainly used to research and find new malware, internal honeypots are mainly used as alerting systems that would alert you when other devices / users are connecting to your honeypots. You can also use honeyd when investigating malware which I’ll discuss in a later tutorial. This will also work for any Debian based Linux system. To install on other distributions such as Gentoo, Fedora, Slackware, etc I would check their documentation on how to install packages. After honeyd is installed the next thing we’ll need to do is create a configuration file. A honeyd configuration file is the heart of your honeypot. The configuration file tells honeyd what operating system to emulate, what ports to open, what services should be ran, etc. This config file can be tweaked to emulate all sorts setups but for right now let’s look at a simple setup and get that up and running. Below is my config file. Within Backtrack you can use Kate or nano text editors to create this file. In Backtrack Kate is under the Utilities menu. The “create default” section simply tells honeyd to drop traffic unless it is defined later in the configuration file. I find this section is needed when you let your honeypot acquire an IP address via dhcp. Also it’s probably a good idea to implement this section so that you only answer to network connections that you define later in the config file. Anytime you see “create” within the config file you are creating a template for a honeypot, so you can create as many honeypots as you’d like within the honed.conf config. In the windows template we are defining a number of things. First we are setting the personality, meaning when another device on the network connects to this honeypot it will appear to be a Windows XP Pro SP1 device. This is emulated via network stack fingerprints. In the windows template I’m also opening up three ports (135, 139, and 445). These are common ports that are open on a windows system. The “action reset” statement will drop traffic if it is not aimed at the open ports defined in this config. The “set windows ethernet” sets a MAC address for our honeypot. This will be needed if you run your honeypot via dhcp. You can simply make up any MAC address you’d like, I usually keep it close to the physical MAC address that I’m running the honeypot off of. Finally the dhcp statement tells the windows template to acquire an IP address from dhcp. Now that we have our honeyd.conf file properly setup it’s time to launch honeyd, below is the command I use when initially getting honeyd up and running. This entry was posted on Friday, May 6th, 2011 at 11:27 pm	and is filed under honeypot, network security. You can follow any responses to this entry through the RSS 2.0 feed. You can skip to the end and leave a response. Pinging is currently not allowed. I got my honeyd up and running but can only nmap it from a different machine. I am using honeyd on a dual boot system with Windows 7 and Ubuntu (11.10). Well I wanted to ask if instead of using LAN cable for network how can we configure our .conf file for using the honeyd on the WLAN network. I am currently working on a project on Honeypots so need to know how to use it over wifi so that I can present it in the college. Plus one more thing does this configuration works with USB Internet data cards or only on through Ethernet cable? If you wanted to use wireless just then specify your wireless interface in your configuration. For instance in Linux the wired interface is usually eth0 but the wireless interface will be something like wlan0 or ath0. Also when you say USB internet data card I assume you mean an USB to ethernet adapter and yes that will work just fine. Let me know if I didn’t answer your question. Thanks for the tutorial Travis. I have Honeyd running inside a VirtualBox and have the bridged adapter set to allow all promiscuous listening. Unfortunately, my Honeyd machine can’t seem to get an IP. I assigned it a static IP and although it replies to ARP requests, it doesn’t reply to pings. When I do an nmap scan it says that the ports are filtered. Basically, I have the same problem as Edwanny and Sarah were having. When I log the data into the logfile as you suggested, I don’t see the pings. I don’t see them appear on wrieshark either, but I don’t know think I’m supposed to. I have confirmed that it is a bug with VirtualBox. An almost identical bare-metal installation of Ubuntu server worked perfectly while the VirtualBox version did not. Unfortunately, I cannot imagine what settings would cause this, since the machine in question seems to receive DHCP and pings just fine. I ran the exact config file that you suggest, with the exception of changing the last line to read wlan0 instead of eth0 as I am running bt5 on a wireless network. I start the program with honeyd -d -i wlan0 -f honeyd.conf and it starts to go, but after it prints “Demoting process privileges…” it just hangs. I’ve left it running for about twenty minutes and it came up with the aborting dhclient after 12 tries. To return to a prompt I have to kill with “ctrl+C” even after it aborts. I see this question has been asked once before but I can’t seem to locate the answer to this problem. Any help would be appreciated. Thank you and thank you for the tutorial. Sorry for the late reply. I tried searching for answers to your problem but could not find the solution. If you’ve managed to fix the issue I would love to ear your solution. I am working with honeypot for my dissertation work. I had implemented socket for connection. So i want to know that will honeyd be able to monitor that socket port? Also which port will be preferable for socket connection? I would like to thank you Travis for your blog and the immense help it gave me to complete my project. I have taken your some details from your G+ profile(link you gave in about me section of your blog) to put in my acknowledgements and and the link of your blog for references. Thank you for the kind words, just hope this helps others. I am facing the same problem, that is, not able to get dhcp address. I found the solution from above discussion that, we need to change the Promiscuous Mode to Allow All. But how do I do that? Please help. Hi, Thanks for writing such a comprehensive article.. Thanks heaps for this excellent and helpful tutorial! 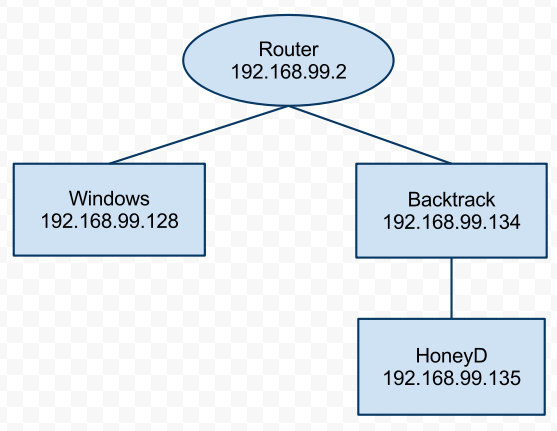 I am new to Honeyd and I was able to implement a basic Honeyd (with one honeypot) and later on to add more honeypots. I was able to scan from a Windows machine using ZENMAP version 6.01 and I found open ports on the Honeyd box installed on Linux Ubuntu, and to find open ports on the virtuals hosts (honeypots) as well as. However, when I run honeyd using “sudo honeyd -d -I eth0 -f honeyd-winxp.conf” everything works fine but stops at “arp reply” once I do a ping scan from the Windows machine with ZENMAP. BUT, THERE IS NO “SENDING ICMP ECHO REPLY”. I also tried to load Honeyd using “sudo honeyd -d -f honeyd-winxp.conf”. Again, everything is fine (listening promiscuously on eth0…, [eth0] trying DHCP, Demoting privileges to uid 65534, gid 65534, [eth0] got DHCP offer…Updating ARP binding …., arp reply…). BUT AGAIN IT DOES NOT REACH TO STAGE OF “SENDING ICMP ECHO REPLY”. As sudo or root run the command “updatedb” then run the command “locate”. This should for the most part always tell you where something is located on the file system in Linux. If that doesn’t work let me know. Thanks heaps for your assistance! I just sent the configuration file as requested. can you pls explain how to detect a spoofed IP using honeypot or by the logs of honeyd my project’s aim is to detect IP spoofing using Honeypot, so far Honeypot is installed up and running perfectly..
Hey Travis I was just wondering where do I save the honeyd.conf file. Hi Travis I was just wondering where I save the honeyd.conf file. You may have already solved this, but figured i would post this anyways. I was getting the “aborting dhclient on interface wlan0 after 12 tries” also and after a few hours or troubleshooting i confirmed it was because my box was on a switch. Honeyd was requesting an IP and the router was offering one up but it was not finding its destination. After i hooked directly into my router, everything ran great. Does anyone know a workaround for this. Being directly hooked to my router is just a temp. solution. Doesn’t matter where you save the conf file put when you specify it on the command line you’ll need to make sure you be specific about its location. how can I hook directly into my router? for ubuntu 12.4? I have your same problem with wlan0, I tried to connect the router directly to the modem but it did not work. I can’t speak to Chip’s solution and I didn’t run my setup on wireless strictly wired. Also are you specifying the proper interface? I did specify the interface replacing eth0 with wlan0. and “-i wlan0” when running. I got the same message “aborting dhclient on interface wlan0 after 12 tries”. I tried to connect through wired connection, it does work -the internet connection-only for “DSL connection” through interface “modem ppp0 “, it seems honeyd didn’t recognize this interface since I got an error with that meaning. 1- to move the connection to from ppp0 to eth0, but couldn’t till now. 2-to install dhcp server in my ubuntu 12.4. Do you think any of these can help? or do you have any other ideas?? I really appreciate your help here. I’m having a couple of problems. first, I am having the same problem as others with the mac address showing up as wrong. the mac address changes every time I kill and restart the honeyd service, and it is followed by (Connect AS) after an nmap scan. second, and the weird part, is that all of my ports are showing up as open. I have the same setup as your file, and I just can’t figure out what is wrong. I have a fresh install of 12.04 on a KVM for this purpose and am running it with a static IP. @zad, yea try eth0. Installing a DHCP server won’t do anything for you. @Dakiem, cant seem to reproduce your problem so not sure what your problem may be. Sorry I cant be of more help. and get Operation not permitted. Any idea what i’m messing up? It can’t find your honeyd.conf, is honeyd.conf in the same directory where you’re running the command? I had this problem running Honeyd in Virtual box. I had to change the Virtual box network settings for promiscuous mode to allow all and then had to reboot Honeyd. When I re-ran the command after reboot I was able to get an IP address. can you tell me the needed settings of the virtual box in order to get honeyd up and running? Has anybody deployed honeyd on a vps? I was wondering how to set it up as you cannot get a separate ip. Other than changing the Virtual box network settings for promiscuous mode to allow all I used the default settings. No other changes were needed. i have install honeyd in ubuntu lts 12.0.3 in my virtual box and i use windows 7 for primary machine. but when i run the honeyd, why i get ip different network from my windows n ubuntu ? I have installed backtrack 5 r3 on my laptop to run side by side with my windows. After that I have tried to use honeyd using my wifi but it does work it gives me an error, but the internet is working and if I use my wired network the honeypot works. Do you have any idea why the wifi does not work? You may have to specify the interface with the “-i” option, if you don’t it may default to wired which in Linux is typically eth0. First run ifconfig to determine the wireless interface name, normally its wlan0. Let me know if that doesn’t work. It really depends on what you want to accomplish. I wanted a simple solution and did not need to get alerted on a lot of activity. If you require multiple kinds of alerts then something like Snort may be a better solution. OS, I will always use Linux as I feel it has better flexibility and is overall easier than security applications in Windows. Yes there are plenty of times where Windows will be easier but Linux is my recommendation. Hope that helps. Did u get any fix lizz?? Maybe specify the interface with the -i option. hi travis . Gr8 tute. I have the same problem which Peter had.But still not solved. I use Vmware 9.0. Can anyone tell me how to configure the network? Hmmm, not sure, wish I had a better answer. Are you running this as root? i need honeyD For win pleas help me and send download linke .